Home » Espresso and Coffee How To Articles » News » New Product Arrivals » Bonavita Variable Temperature Kettles In Stock and Ready To Ship! Synopsis: Following on the heels of the highly successful Bonavita electric and non-electric kettles, the new variable kettles are finally here - grab yours now. We have plenty of variable kettles, electric kettles, stove top kettles, as well as thermal and glass bonavita coffee makers in stock. Beautiful and versatile, no kitchen should be without one. 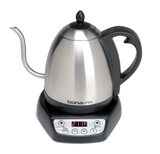 Comments on Bonavita Variable Temperature Kettles In Stock and Ready To Ship!